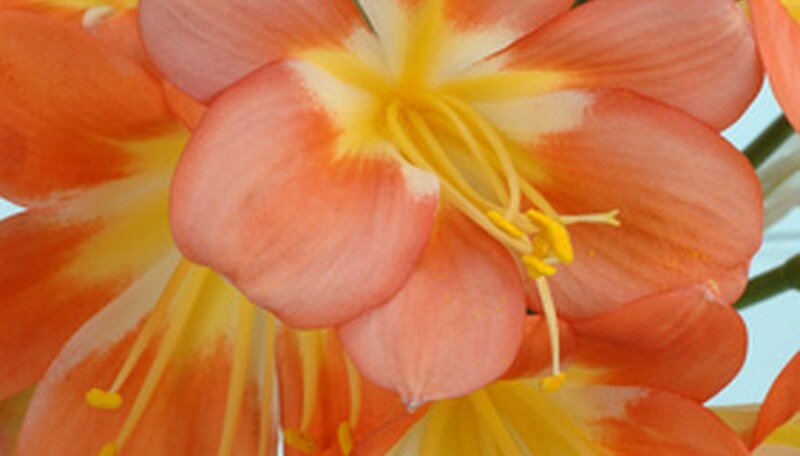 Clivia (Clivia miniata), grown indoors in most climates, is an elegant plant with big, showy, lily-like flowers that appear in the dark days of winter. While clivia is happiest and blooms bests when its roots are slightly crowded, according to retail nursery White Flower Farms, a healthy clivia plant will need to be repotted every three to five years. Don't be intimidated by the prospect of repotting your clivia, as it is a rugged indoor plant that will bounce back quickly. Repot clivia in spring when the plant is just beginning to show healthy new growth. Water the plant the evening before you plant to repot. Select a sturdy pot with a drainage hole. The pot should be only 1 to 2 inches larger than the plant's current pot. Fill the pot about a third full with commercial potting mix for orchids, or a mixture of one part regular potting soil, one part chick starter grit, and one part sand. Tap firmly on the side of the pot to loosen the roots. Remove the clivia carefully from the pot and set it into the new pot. The plant should be planted at the same level that it was planted in its previous pot, so adjust the potting mixture in the bottom of the pot, if necessary. Add potting mixture to the pot, allowing 1 to 2 inches at the top of the container to allow for watering. Tap the pot firmly to settle the soil, and add more potting mixture, if necessary. Water the clivia lightly. Place the clivia in low light for one to two days to allow the plant to become accustomed to its new pot. After that time, place the plant in moderate sunlight, away from hot, direct sunlight.